UN Secretary General António Guterres announced in New York, the appointment of Former German President Horst Köhler as his new Personal Envoy for the Sahara, succeeding to Christopher Ross. Kohler, who boasts over 35-year expereince in the German government and international organizations, was appointed by the new UN Secretary General Antonio Gueterres after receiving the approval of the parties to the conflict: Morocco and the Polisario, which acts upon the orders of its paymaster and host, Algeria. By opting for Kohler, the new UN Secretary General Antonio Guterres upholds the principle of rotation in Sahara personal envoy between the US and Europe. 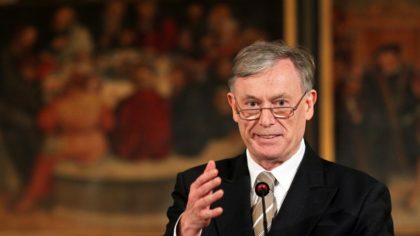 Given his background, Köhler is expected to lead UN mediation in the regional dispute over the Sahara with pragmatism, unlike his predecessor Christopher Ross whose stands reflected connivance with Algeria and a willingness to change the parameters of negotiations. After eight years as UNSG Personal Envoy, Ross left a legacy of failures on the Sahara issue. His term was marred by partial reports and a stagnating negotiation process. Köhler is an economist by profession. Prior to his election as President, he had a distinguished career in politics and the civil service and as a banking executive. He was President of the European Bank for Reconstruction and Development from 1998 to 2000 and head of the International Monetary Fund (IMF) from 2000 to 2004. From 2012 to 2013, he served on the UN Secretary General’s High-level Panel on the Post-2015 Development Agenda. Written by: Jaber Ali on August 16, 2017. Posted by Jaber Ali on Aug 16 2017. Filed under Headlines, World News. You can follow any responses to this entry through the RSS 2.0. Both comments and pings are currently closed.